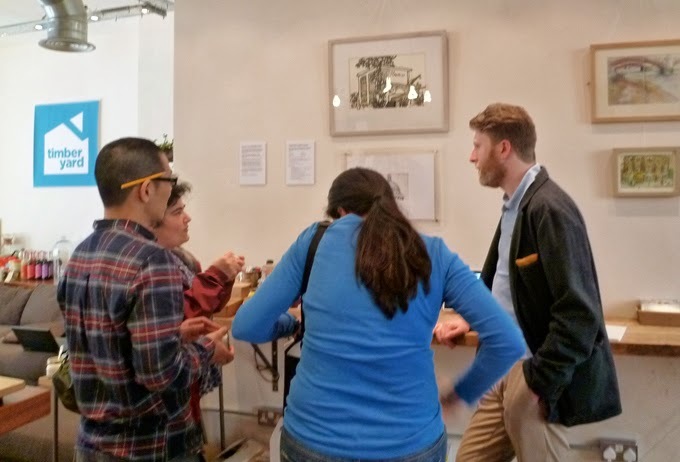 Six of London's Urban Sketchers – Thomas Corrie, James Hobbs, Isabelle Laliberté, Jhih-Ren Shih, Katherine Tyrrell and Zhenia Vasiliev – are showing drawings at Timberyard cafe, Old Street, London, following on from a recent exhibition at its Covent Garden branch. 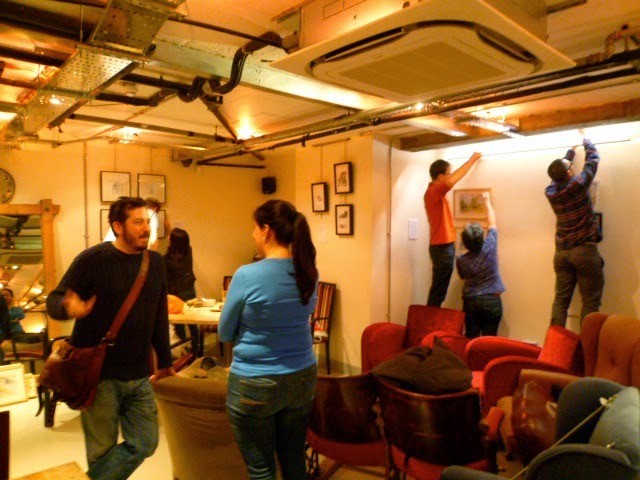 The Old Street cafe, which is a popular destination for freelance/wifi/e-workers, and close to the cluster of tech companies around the Old Street roundabout, will host the exhibition until 30 June 2014. Details of the private view and sketchcrawl are coming soon. Visit our Flickr site for a short video of the exhibition. According to Twitter, it’s Museum Week and yesterday I visited the RAF museum. We are very lucky in London to have so many amazing museums to visit but I have to admit I’d never been to this one before. It was well worth the trip from sunny south London via the Northern Line to Colindale with lots to see and the bonus of free entry! I used watercolour pencils and a water brush for the colour on these two sketches. 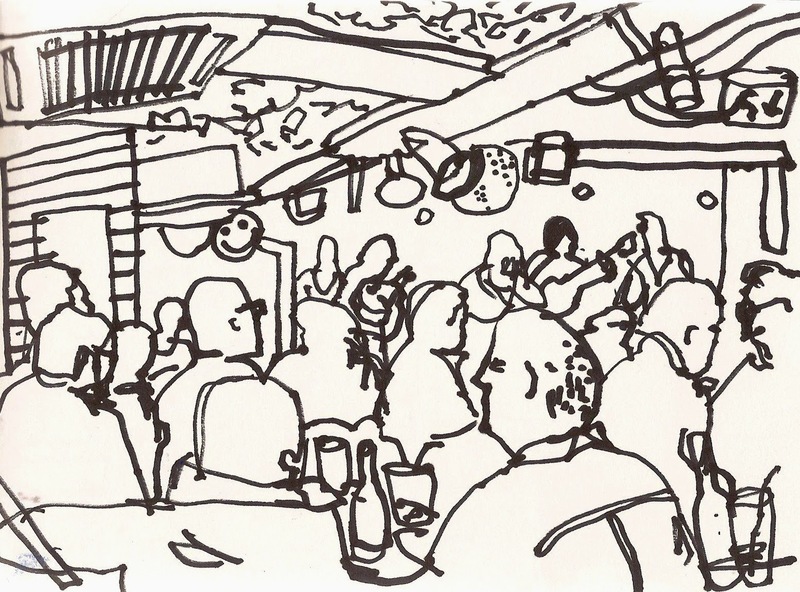 My take on the evening drawing with James Hobbs at The Underbelly venue on Thursday night. There are others on my site and on Art on the Left. Having to work unsociable hours is the way to go. Evelyn Rowland and I went to the Underbelly in Hoxton Square, London, last night, where we had been invited to draw by the management of the band Jay Scott and the Find. It was a hugely entertaining evening, with a fantastic atmosphere. 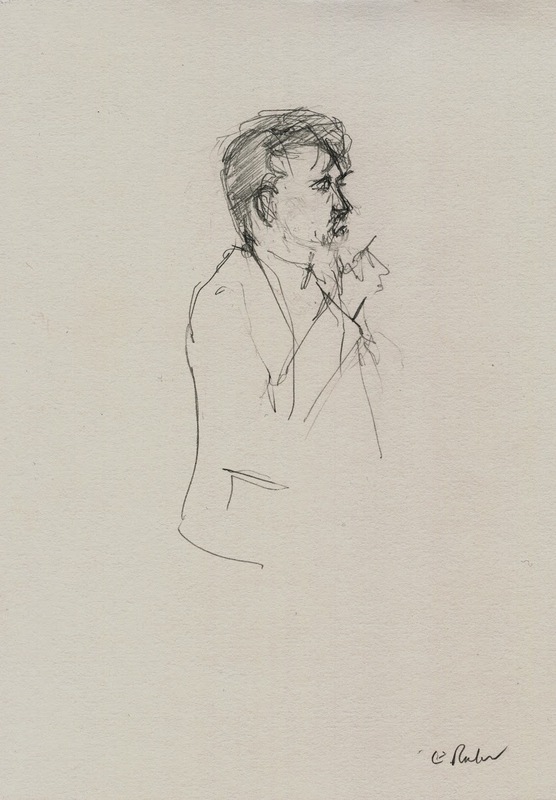 A variety of factors made it unusually challenging to draw, particularly the low light levels, and crowded, jostling audience, but these can be the exactly the things that can help a drawing capture the moment. 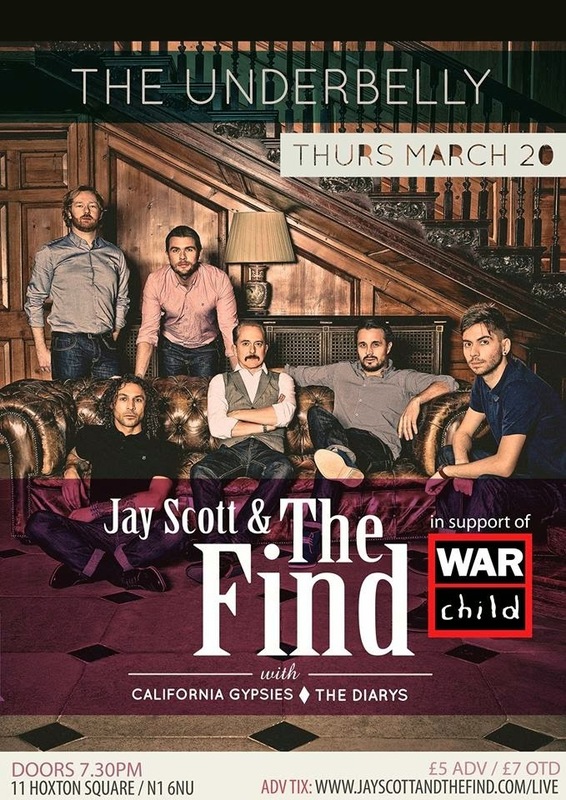 The gig supported the charity War Child, the charity for children affected by war. Thanks to Jay Scott and the Find! Good luck with the new album! There are more drawings at www.james-hobbs.blogspot.co.uk. 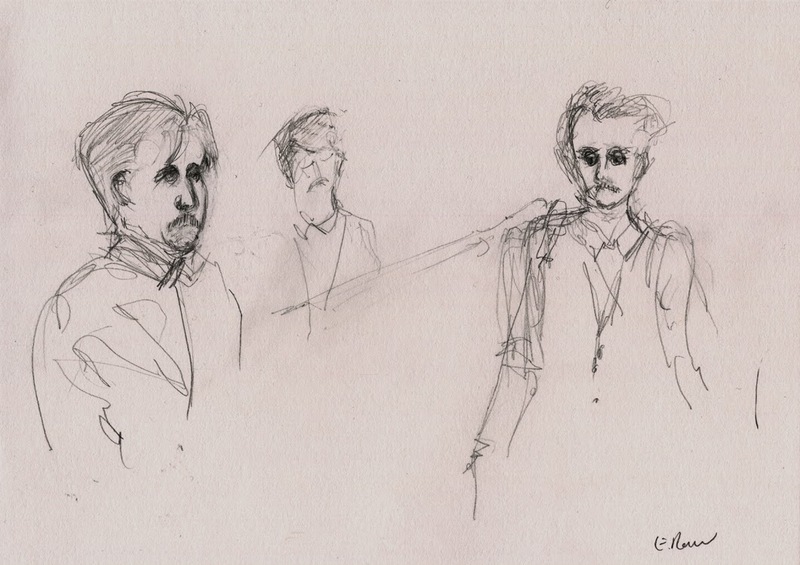 Drawing "Jay Scott & The Find"
at The Underbelly, Hoxton Square, London N1 6NU on Thursday 20 March. The band is going to be playing a full set from its brand new album at the event, which is in support of the London-based charity War Child. 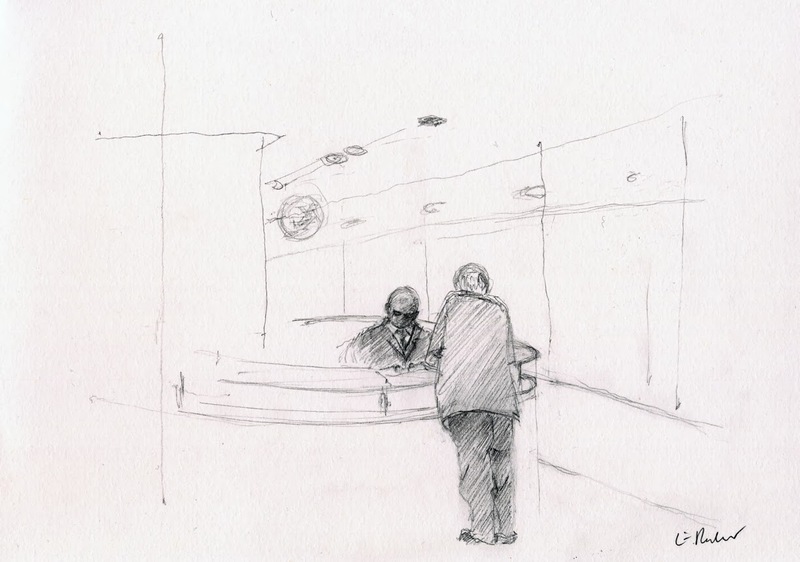 Check back here later this week for images of the sketching done on Thursday night. Yesterday the Crimeans voted in referendum about accession to Russia, referendum recognised as illegitimate by Obama and the EU. Hundreds of supporters with yellow and blue flags came out to march from Marble Arch to the Russian embassy to raise the issue of Putin's invasion of Ukrainian territory. On a separate note - an ethnic population of Crimean Tatars refused to take part in the referendum and many fled. Last week my friend has housed a family of eleven in her skiing cottage in the west of Ukraine. I really hope this insane behaviour by Kremlin will get an adequate response in form of real sanctions and political pressure from UK and the world. I’d never thought of South Norwood in south east London as a travel destination but I was intrigued when I saw a group on Twitter called the ‘South Norwood Tourist Board’. 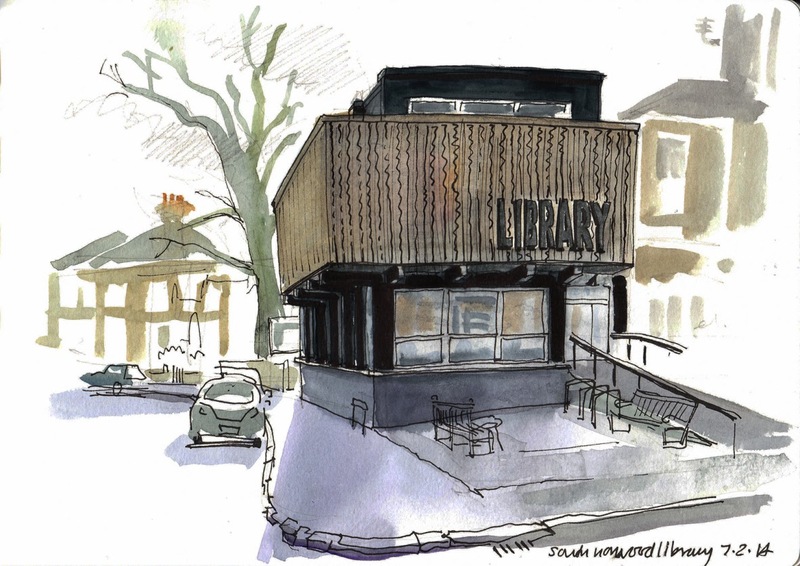 An initiative set up by local people, they have ‘been set up to promote the regeneration of South Norwood by developing tourism to the area’ and have ‘no funding of any kind’ with the project being ‘quite simply a labour of love’. I drew the Stanley Halls, the lake and the library before the crowds arrive. 199 Bishopsgate, "I'll see you tomorrow then." 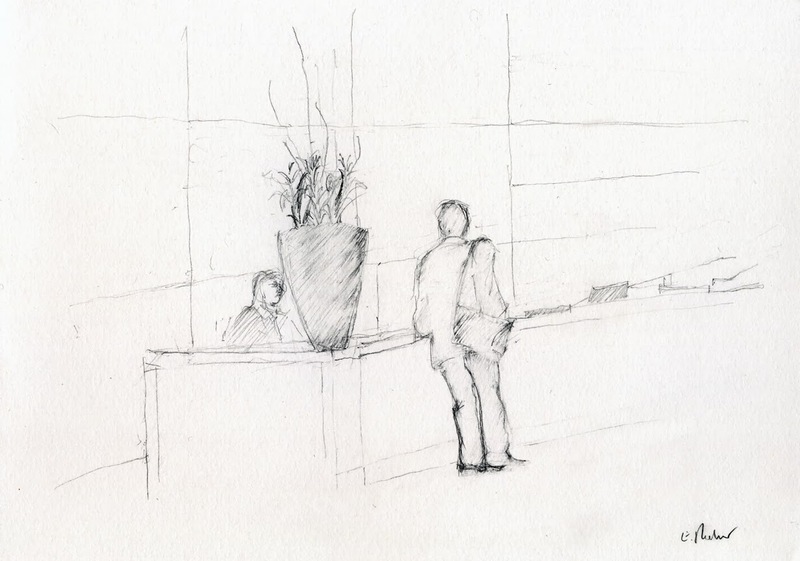 I have been enticed by the soulless, tinted glassed, open place of the office block reception. Full of reflections of other corridors, lights, and men whose job it is to sit there and stare into the night. It's the loneliness that gets me.